As the Shangri-Las sang . . . the past, let me tell you about the past. Or, rather, of course, not the past but pasts. The present, too. The future, even. Dialogues across the years (and decades). The only real time travel there is, sadly. 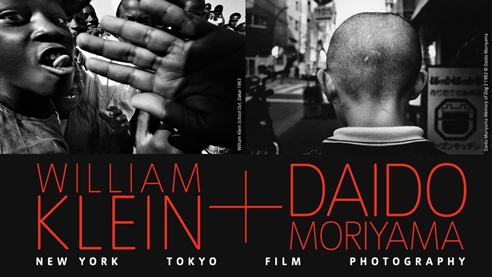 And so to the William Klein/Moriyama double-header at the Tate: a dialogue across time and space. An American in Paris, shotgun-hitched with a man from Tokyo, ten years his junior and quite different in so many ways — temperament, vision, style. It’s a strange marriage. I’ve heard that Klein wasn’t too pleased to be sharing his Tate time with Moriyama. Not that he had anything against the Japanese photographer. It was just that, well, he thought it should be a solo show — ein Klein ding, so to say. As I write this, the show is yet to open. That, of course, is no kind of reason not to write about it now, without having seen it. Some of my favourite books are ones I’ve never even held in my hands, let alone read. On that point, I’m with the French writer Paul Valéry who said that not-reading a book almost certainly made him a better judge of its worth than someone who had actually read it. Just as all worthwhile writing is a kind of disguised autobiography, so all creative reading (and non-reading) is, too. The same goes for image-making. No viewer, no photograph. No cinema-goer, no movie. Yet, while it is smart, it is also not just partial but also a stupid lie. Meaning resides in the beholder as much as in the image or the mind of its creator. As much as they can close minds, postcards can also dream possibilities into being. My London, New York, Paris, Tokyo, they are all as much dreams dreamed by others — by photographers and film-makers — as they are places in which I’ve actually walked and talked. Brassai’s city of night is part of my Paris, even though it had, in ‘reality’, long gone before I even saw the place. So, too, is the light-saturated exuberance of Godard’s A Bout De Souffle. Brassai and Godard’s Paris: these are not mere images or prisms through which I view the city. Postcards all, in their own way. For the Tate show, the curators decided it would be a neat idea to have images of cities by the two photographers. Klein is too old etc to have made any new pictures, so they used some of his old etc famous ones. Moriyama, though, did pick up his camera and shoot London. Klein’s still sing, loudly. Picture talks to picture. A model, in 1960 and stripes, on a Roman road-crossing. An English football hooligan, thirty years later, in Turin and a striped shirt, teamed with a Union Jack cap. Deepest and deepest-felt of all, Klein’s Mickey Has Come To Save Times Square, the 1998 collage which offered a new kind of reportage. Really. Having been its own great black pit for a generation or two, Times Square had just seen the arrival of a Disney Store into the very place where Diane Arbus had once caroused and photographed our subconscious. Photography, she said, was something she thought of ‘as a naughty thing to do’. Times Square was also the spot at the heart of the city about which Moriyama made his own first book, 1974’s Another Country In New York — over, under, sideways down images, filtered through the colanders of Andy Warhol and a Canon U-Bix copier. I can’t make up my mind about Moriyama’s new pictures of London, though. They are — or, at least, seem to be — dead. They are images that any tourist could make. A juxtaposition of Battersea power and a giant billboard. Bansky graffiti that’s been graffitoed. Are they just an unknowing foreigner’s unknowing pictures of a seemingly known but tragically unknown metropolis? Or is Moriyama actually playing with that idea? Is he creating commentaries on our cities by, self-consciously and knowingly, creating images that inhabit the world of over-confident knowing? When I figure that out, I’ll let you know. On a postcard.